This post should have been posted since friday but 9ja factor…. The FIFA U-17 Women’s World Cup kicks off on Saturday 22nd September 2012 in Azerbaijan and Nigeria is dully represented by the flamingoes. The flamingoes have been ever present at the FIFA U-17 WWC and two years ago in Trinidad and Tobago became the first African country to qualify from the group phase. They lost to eventual champions Korea Republic in the quarter finals 6-5 in extra time, after winning all 3 of their group stage matches. The present team is coached by Peter Dedevbo, who also doubles as coach of Delta Queens. They had little trouble qualifying for this World Cup. They beat Kenya 5-0 on aggregate and Zambia 7-1 on aggregate. Following the exploits of Nigeria’s U-20 women, the falconets, in the just concluded U-20 world cup, the Flamingoes will want to do better. 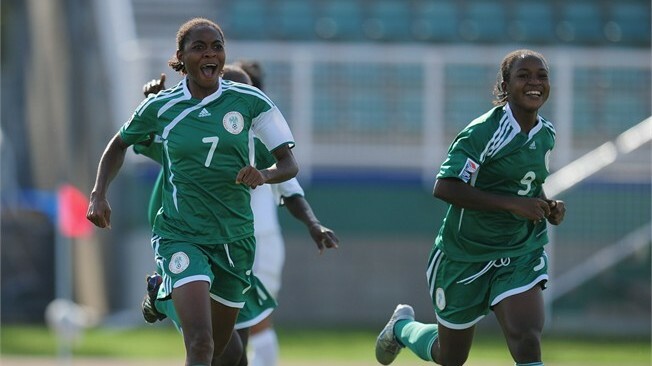 Nigerians are expecting a good showing from the girls in Azerbaijan. A semifinal berth is not bad. Gold would be celebrated and should be honoured by the presidency with National Awards and Monetary gifts. Support Nigeria.